Last night a public forum was held in Santa Rosa to discuss the issue of mental health parity. Most of the attendees, speaking about their own personal experiences, focused their criticism on Kaiser Permanente’s substandard mental health services. Kaiser Permanente’s local mental health services were strongly criticized Wednesday evening during a public forum in Santa Rosa aimed at spotlighting laws that require insurance providers to offer equal coverage for both mental health and physical health conditions. A majority of the at least 40 speakers who addressed a panel, which included state and federal health care officials, blasted Kaiser, saying the HMO had failed to provide adequate and timely mental health services. Jessica Birrer, 34, of Santa Rosa said she has suffered from post-traumatic stress disorder for 12 years. Birrer said she has not received sufficient care from Kaiser mental health professionals, whom she has seen only three times in the past two years, twice related to medication services and once for therapy treatment. This entry was posted in Kaiser Permanente and tagged denial of care, Kaiser Permanente, mental health, national union of healthcare workers, Press Democrat, Santa Rosa on September 25, 2014 by The Kaiser Patient Advocate. The San Francisco Examiner recently published an op-ed by Sal Roselli, the president of the National Union of Healthcare Workers, calling on the Department of Managed Health Care to hold Kaiser Accountable for the various problems with its mental health care services. 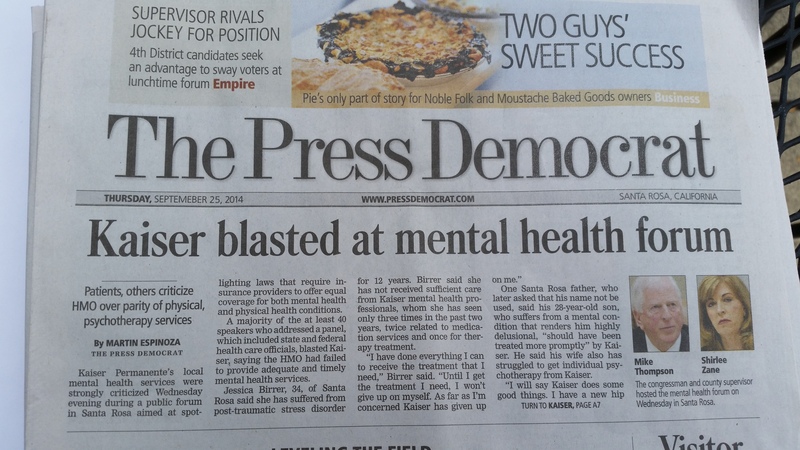 Kaiser Permanente is failing its mental health patients. Spurred by whistle-blower complaints from Kaiser’s own mental health clinicians, an investigation by the state’s Department of Managed Health Care found the HMO guilty of serious and systemic violations of California law that put mental health patients at risk. The result: In June 2013, the DMHC levied a $4 million fine — the second-largest in the agency’s history — against Kaiser for forcing thousands of patients to endure illegally lengthy waits for care, falsifying patients’ appointment records, and violating the California Mental Health Parity Act, which requires HMOs to provide psychiatric services that are on par with their primary health services. 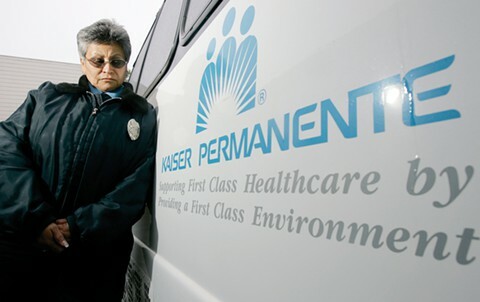 “Kaiser appealed, of course, but now faces the prospect of a hearing, scheduled to begin Monday in Oakland, during which patients and whistle-blowers would give public testimony regarding Kaiser’s deficient care. For weeks, Kaiser has been negotiating a settlement with the DMHC in hopes of avoiding such a spectacle, and a settlement is indeed likely given Kaiser’s political connections. To read the full op-ed, click here: SF Examiner: Kaiser Must be Held Accountable. This entry was posted in Department of Managed Health Care, Kaiser Permanente and tagged mental health, national union of healthcare workers, NUHW, Sal Roselli on September 4, 2014 by The Kaiser Patient Advocate. Enter your email address to receive updates of new posts by email.